Over 30 Proven and Effective Brief Interventions for Student with Emotional and Behavioural Problems will guide you through focused, clear and proven approaches to working with children and youth. Every professional who seeks to fill their toolbox with tested methods will leave this seminar with a wealth of fresh ideas and rejuvenated spirits. With nearly 30 years of clinical experience and a background in improvisational comedy, Dr. Steve is a strong proponent of “Edu-tainment”. He uses wit and humour to enhance your learning experience, improving the retention and utilization of the skills covered. You will leave this workshop with new strategies for success and techniques to revitalize your interactions with students. † The Alberta College of Social Workers (ACSW) and the Newfoundland and Labrador Association of Social Workers (NLASW) accept CPA-approved CEUs. * Participants will receive a certificate of completion after every workshop. Workshops are pre-approved for 5.5 or 6 credits per day unless otherwise specified. 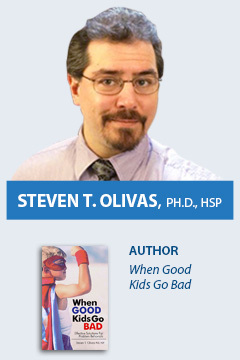 Steven T. Olivas, Ph.D., HSP, is a Licensed Psychologist in Private Practice in Middle Tennessee. He began his practice career in 1991 when ADHD was exploding onto the scene, and has enjoyed working with the energy and spontaneous creativity of children ever since. Throughout his career, he has taught courses at nine colleges and universities, been a national public speaker, a regular columnist for a local newspaper, and co-host of a popular radio show. He is also the author of the acclaimed book, Bad Kids… or Bad Behavior? For nearly twenty years, he has been helping parents, clinicians, and school systems. Education and Clinical Professionals: K–12 Classroom Teachers, School Counsellors/Psychologists, Learning Assistance/ Resource Teachers, School Administrators, School Paraprofessionals including Special Education Assistants, Classroom Assistants and Childcare Workers. All other professionals who support students including but not limited to: Nurses, Social Workers, Psychologists, Clinical Counsellors, Family Therapists, Occupational Therapists, Speech Language Pathologists, Addiction Counsellors, Youth Workers, Mental Health Workers, Probation Officers, Police Officers, and Early Childhood Educators. Parents, Caregiver, Foster Parents, Grandparents, and Extended Family raising a child. To receive the early bird rate, registration and payment must be received by Wednesday, April 24, 2019.